I live in Chiba New Town, a huge residential complex in the Hokuso area of northern Chiba Prefecture. Conveniently situated less than an hour’s train ride from central Tokyo, this area has been intensively developed as a planned suburban commuting town. Just outside the new housing districts, however, the countryside landscape remains in excellent condition. Rather than isolated farmsteads scattered across the landscape, the basic settlement pattern in these agricultural districts is small, concentrated villages, usually called mura or shuraku. Typical mura consist of several dozen farmhouses clustered tightly together, sometimes in a thin line running along the edge of a narrow valley, and sometimes in a wider settlement on top of the high ground. Each mura is a tight-knit social and cultural unit. A village association, or chonai-kai, is responsible for disseminating information throughout the households, and also for representing the opinion of the villagers when dealing with outside forces such as the municipal government. Despite the intrusion of the immense residential complex into the area, the surrounding villages have for the most part managed to preserve their unity. As farmers, the villagers are held together by a core of shared interests and cultural values, which differ significantly from those of the people in the housing complex. Another powerful force holding the community together is the spiritual element. 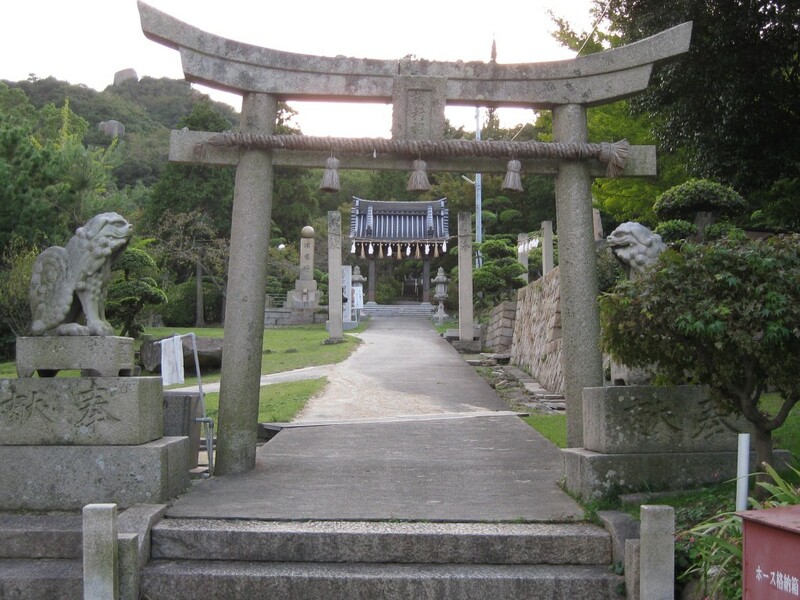 Each individual mura is guarded by its own special Shinto shrine, called an ubusuna jinja, which houses a tutelary kami deity that watches over the interests of the villagers. As might be expected, the countryside landscape is packed with these small shrines. As an added bonus, almost all these shrines are surrounded by substantial sacred groves. These groves tend to be dominated by native evergreen broad-leaved species such as chinquapins and live oaks. One shrine in my area, however, features several immense Japanese torreya trees. Torreya, sometimes called nutmeg-yew in English, are conifers usually classified in the Taxaceae or Yew Family (Ichii-ka in Japanese). There are a half dozen species known worldwide, including four in Asia and two in North America. The Japanese species, kaya (T. nucifera), grows from southern Tohoku through Shikoku and Kyushu. The favored habitat of these trees is mountain slopes, and they do not usually grow wild in the lowlands of the southern Kanto. When planted, however, they can easily reach 20 meters in height and two meters in diameter. The kaya shows whitish-gray bark that splits vertically. Although technically a conifer, the fruits consist of hard nuts surrounded by fleshy green coverings. The leaves are incredibly stiff and sharply pointed, and will prick a finger painfully if carelessly handled. On the leaf underside run two thin parallel lines of lighter green. These are the stomatal belts, which contain numerous tiny openings, called stoma, through which the leaf exchanges gases with the atmosphere. The nuts of the kaya are edible, and are also used to make oil for cooking, lighting and cosmetics. The pale yellow wood is hard with beautiful grain, and is the preferred material for all top quality go and shogi playing boards. Both the nuts and fleshy coverings are used in traditional Asian herbal medicine to treat constipation, urinary disorders and some internal parasites. 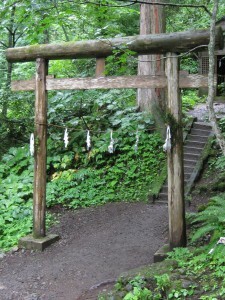 Ubusuna precincts often contain an assortment of smaller shrines and memorials dedicated to various local spirits. One particular shrine also features a series of beautiful carved-wood panels, depicting 12th-century historical figures. One of these is Tokiwa Gozen, said to have been the most beautiful girl in Heian-kyo, as Japan’s capital city of Kyoto was originally called. According to legend, in the early 1150s, there was an opening for a young girl to serve as maid in the Imperial Palace. A thousand of the most attractive girls in the city were rounded up as candidates. This group was then pared down to 10 finalists, from which Tokiwa was chosen a 12th-century Miss Heian-kyo! Tokiwa was later taken as concubine by a samurai named Minamoto no Yoshitomo, leader of the powerful Genji clan, with whom she had three sons. In 1160, her husband participated in a rebellion against the Heike clan, which then held supreme power. Yoshitomo was killed and his severed head put on display in the capital. Fearing for her life, Tokiwa took her three children and fled southward, over the mountains in winter, to Yoshino in southern Nara Prefecture. When she returned to the capital, Taira no Kiyomori, the head of the Heike, agreed to spare the life of her three children. According to popular story, Kiyomori himself was totally enchanted by her beauty, and the two became lovers. In an odd twist of fate, her youngest son Yoshitsune eventually led the Genji to final victory against the Heike. The image of the dedicated mother Tokiwa fleeing across the snow-covered mountains with her children is one of Japan’s most popular motifs, reenacted over and over in popular literature, art and theater. This is a fantastic website, would you be interested in doing an interview about just how you produced it? If so e-mail me personally!